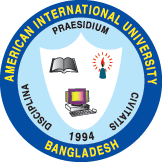 American International University-Bangladesh (AIUB) has organized an Inter Department Six-a-Side Football Tournament from June 12, 2008 (Thursday) to June 17, 2008 (Tuesday) in the Banani Club Ground. In total 24 teams (216 players) from different Departments (both undergraduate and graduate) and two faculty/Officers team is participating in the tournament. The Honorable Vice Chancellor of AIUB Dr. Carmen Z. Lamagna inaugurated the tournament in the Banani Club ground at 10:30 a.m. on June 12, 2008. Among others the opening ceremony was attended by the Honorable Vice Presidents (Academics) Prof. Dr. Tafazzal Hossain, Registrar, Deans, Faculties, Coordinator (office of Sports), Coordinator (office of Student Affairs), Director of Administration, Director of Public Relations along with the other University Officials and students. In the opening match BBA (Bright Shiners) beat EEE (Eclipsc) by 9-0. Mr. Tanzid Touhidi Khan scored 6 goals (double hattrick) and Kamrul Islam scored 2 goals and Iftekhar Nayeem scored 1 goals for the winning team. The final match and the presentation of awards will be held on June 17, 2008 at 4 p.m. in the Banani Club ground.